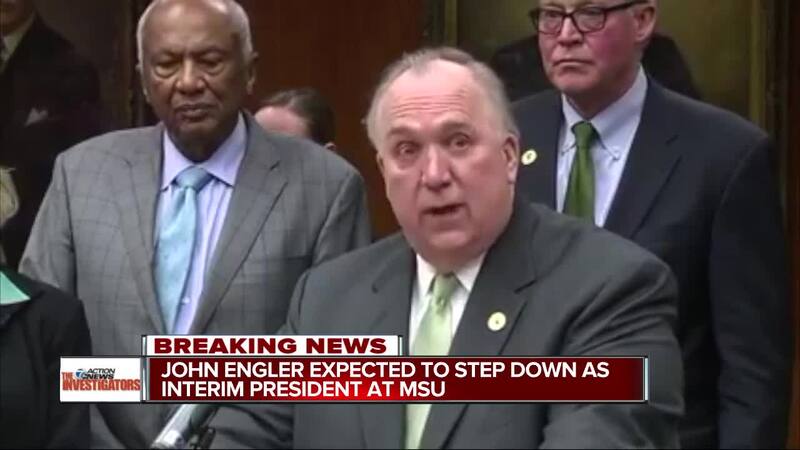 Michigan State University's interim President John Engler announced in an 11-page resignation letter than he'll quit in a week. This news comes hours after the university's board of trustees scheduled a meeting where the board was expected to vote to fire Engler. Engler's replacement is expected to be Satish Udpa, who currently serves as the executive vice president of Administrative Services at MSU. He will be appointed by the board of trustees after a vote. Udpa, who joined MSU in 2001, has served as the Dean of the College of Engineering and Chair of the Electrical and Computer Engineering Department, according to the university's website. On Wednesday, Trustee Brian Mosallam told the Associated Press that if Engler didn't resign, they would "vote to remove him," and that he believed "the votes are there." The move came after Engler told the Detroit News Editorial Board on Friday that woman who were sexually assaulted by Larry Nassar had been in the spotlight and were "still enjoying the moment at times, you know, the awards and recognition." It's not clear who the board will appoint to replace Engler, who was appointed in January 2018 to replace former President Lou Anna Simon. In a tweet, Sen. Gary Peters said "I’m glad the Board is taking action. 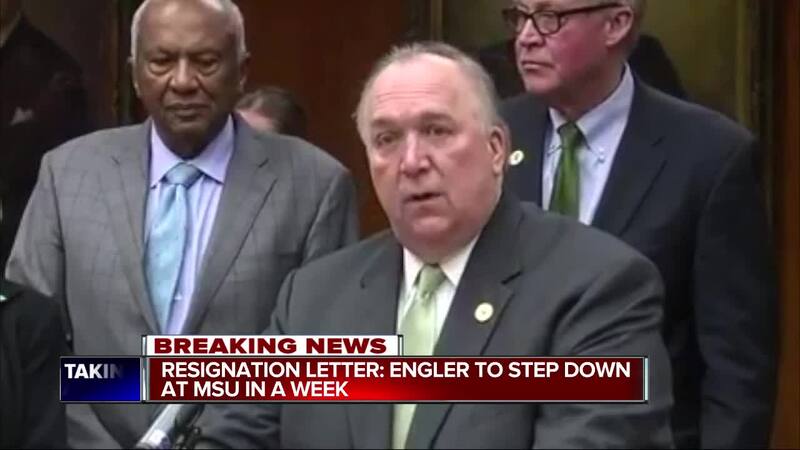 I have long believed that Mr. Engler was not the right person to lead MSU—and it’s been clear the healing process could not happen with him in charge." 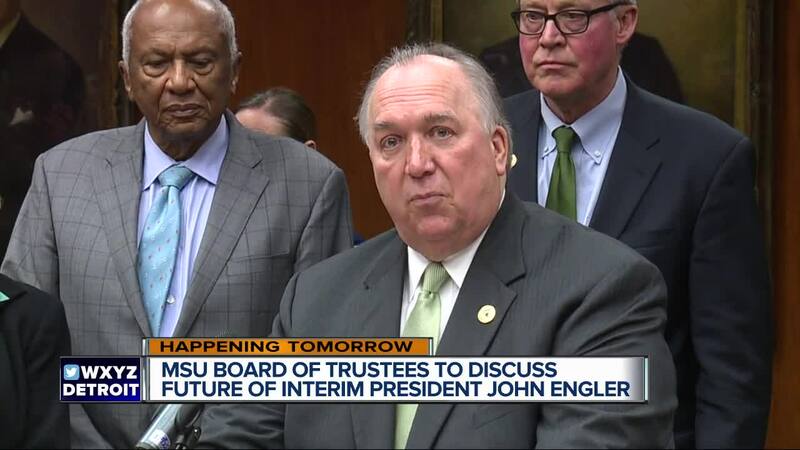 Sen. Debbie Stabenow added, "As I said before, John Engler was the wrong choice to lead MSU, and it’s past time for new leadership." 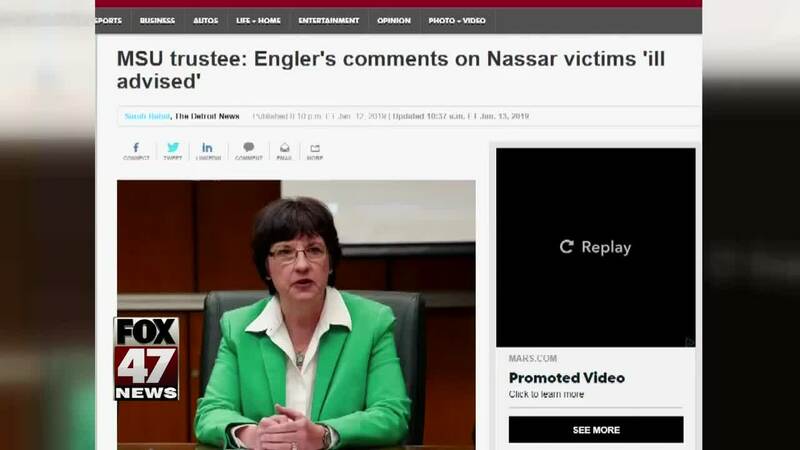 This isn't the first time Engler had made news for his comments regarding Nassar survivors. 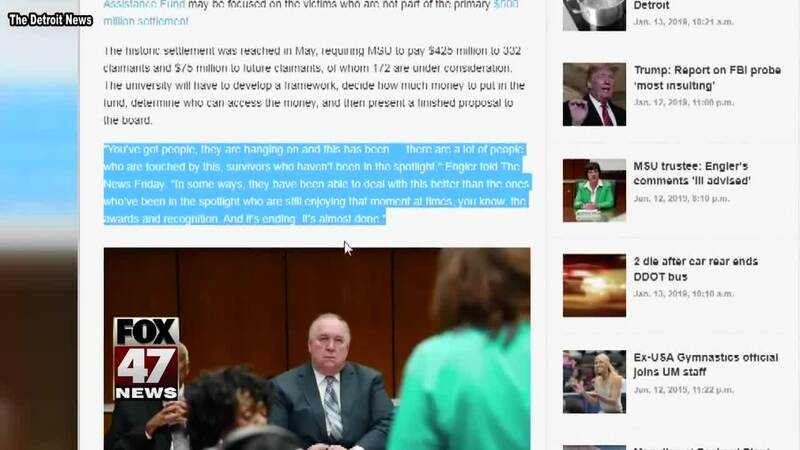 Emails in June 2018 show he criticized lawyers who represent Larry Nassar's assault victims and said a former gymnast was probably getting a "kickback" from her attorney. Engler said he thought victims were "being manipulated by trial lawyers" and that lawyers would get "millions of dollars more" than their clients. Engler said he thought Rachael Denhollander was likely getting a kickback from her lawyer. She has been outspoken and in 2016 was the first to publicly say she was a Nassar victim. More than 100 survivors also said he had "failed miserably" and called for his removal back in June, which came shortly after the remarks and after Trustees Mossalum and Dianne Byrum called for his resignation. "We, the Sister Survivors of Larry Nassar's horrific sexual abuse, stand together against the recent character attacks made towards us and derogatory statements aimed at all survivors of sexual abuse by Michigan State University President John Engler," the letter begins. 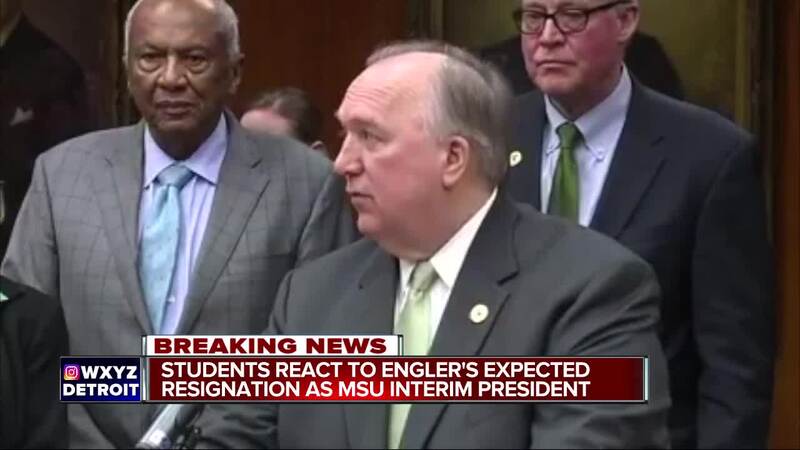 "While our hope had been that President Engler would bring accountability, transparency, and change to MSU, it is clear to us that he cannot." His remarks were made to another university official in April 2018, a month before Michigan State agreed to a $500 million settlement with hundreds of women and girls who said they were sexually assaulted by Nassar, a former campus sports doctor now serving decades in prison. The Chronicle of Higher Education and Detroit Free Press reported on the emails Wednesday. "President Engler's abhorrent behavior - including gaveling down a survivor who only wanted him to listen and belligerently abrasive statements unmasking a survivor who only sought the comforts of confidentiality - has sent a chilling message across MSUs' campus, causing damage that cannot be repaired until he is gone," the letter continues. It goes on, saying, "President Engler has failed miserably," and calls out Trustees Melanie Foster, Brian Breslin, Mitch Lyons, Joel Ferguson, Dan Kelly and George Perles to stand up against Engler.